Mac OS X are great. It would be interesting for all of us trying to develop hardware on a Mac OS X. So is there some good circuit simulator being used to design and simulate on Mac ? The following is a list of circuit simulator that works on Mac. Some of these software are designed to run on a Macintosh and some of them runs on different platforms. 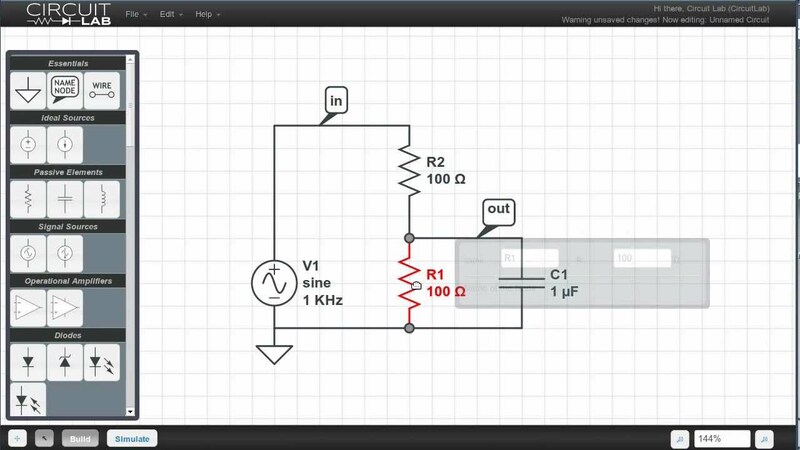 EasyEDA is a free circuit simulator on Mac for electronic circuit design and simulation. It’s a perfect tool for helping you complete your design from schematic to the finished PCB in the shortest time and easiest way. The Mac OS X sistem works fine on the software and has a nice Mac like user interface. Moreover, wheather you are using Mac, Linux or Windows; Chrome, Firefox, IE, Opera, or Safari. EasyEDA has all the features you expect and need to rapidly and easily take your design from conception through to production. 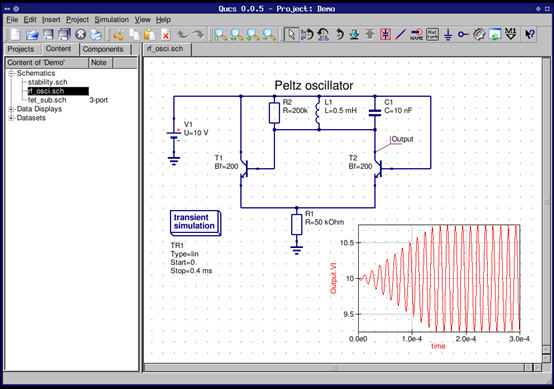 This circuit simulator on Mac was designed to provide electronic hobbyists, engineers, teachers, students ... an easy and free access to the EDA. 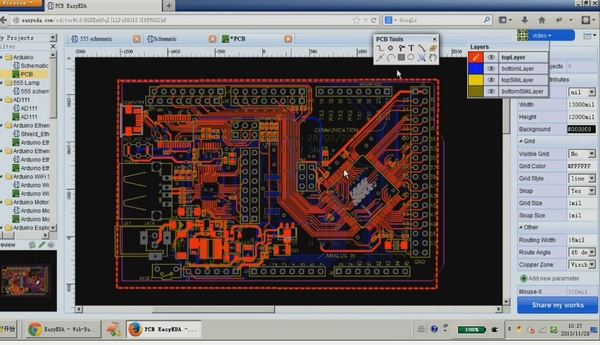 With EasyEDA, powerful schematic capture, mixed-mode spice simulation and fast PCB layout are made in your web. Browser. What does EasyEDA provide for you? It provides the import of schematics and PCB Files form Eagle ,Altium Designer,Kicad ,LTspice. iCircuit, a neat little circuit simulator app that works on Mac as well as mobile devices. 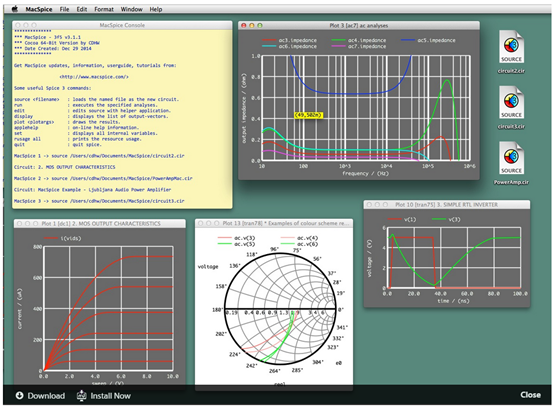 It's a great simulator for Mac OS X and great for students and hobbyists and supports both analog and digital circuits with inbuilt oscilloscope and meter simulations.There are a couple of headline features: one is OS X, and IOS versions for Mac, iPhone and iPad; Another is real time simulation. iCircuit simulations run as you work, so you can quickly see how changes to components impact your project, and you can monitor signals with the scope and meters as you go. But the library of components in iCircuit is pretty limited, so it’s not going to replace a SPICE type tool for professional simulation. It lacks a tool bar for the schematic editor which makes editing layouts directly pretty cumbersome and you have to import schematics in from something else which is a whole other business. The Windows interface is much nicer. But for learning and testing simple circuits it’s pretty useful and way more fun. MacSpice runs on Intel architecture Apple Macintosh computers and is distributed as a Mac OS X application bundle. It provides an enhanced versions of the Spice 3 simulator and the Nutmeg front-end command interpreter for data analysis and plotting. MacSpice simulates and analyses electronic circuits that can range in complexity from a single resistor to an integrated circuit comprising tens-of-thousands of devices. It has users who range in experience from novices to retired integrated circuit designers. What MacSpice does? 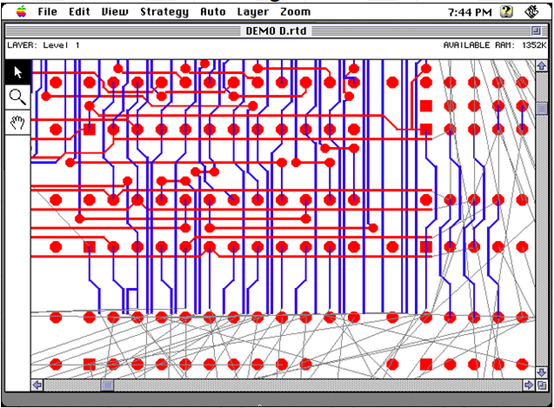 MacSpice is circuit simulation tool for building, testing a numerical model of electronic devices and analysing them. MacSpice helps the user by providing error messages, warnings and explanatory notes. MacSpice can be used for plotting but it do not offer any schematic capture. The 4.1 version of LTspice for Mac is available and could be download free. The Mac version of LTspice is a piece of crap. Having to run a virtual PC or reboot using BootCamp feels unnecessarily slow and convoluted. But there’s a way of running it as a “normal” Mac application. McCAD were originally designed to run on a Macintosh. McCAD E.D.S software, a complete family of integrated electronic designs systems for MS Windows and Macintosh OS platforms. McCAD Electronic Design Systems offer a choice of design environments with a wide range of system configurations tailored to the specific needs of the designer. McCAD modules take the designer through the complete design cycle: Schematic capture, Simulation (analog & digital), Printed Circuit Board layout, Autorouting and Gerber generation for board fabrication. McCAD software gives the electronic designer the technical range needed, and at the same time provides control and flexibility. Since few commercial EDA tools run on the Mac, this feature has made gEDA a popular electronic design package amongst Mac users. It produce tools which are used for electrical circuit design, schematic capture, simulation, prototyping, and production. gEDA project also offers a mature suite of free software applications for electronics design. 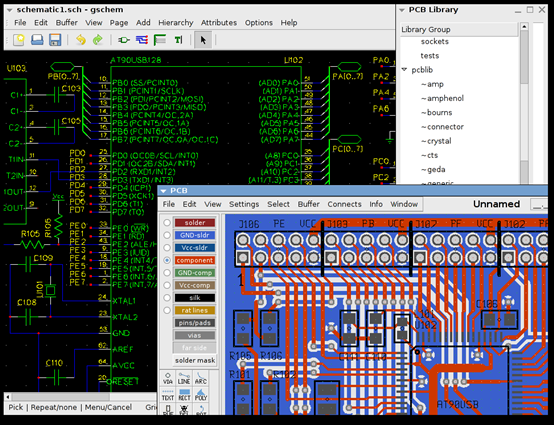 CircuitLab is a schematic editor and circuit simulator working on Mac, Windows, Web / Cloud, Linux, Android and more. There are a couple of headline features of Circuitlab: Design with our easy-to-use schematic editor; Accurate analog & digital circuit simulations in seconds; Professional schematic PDFs, wiring diagrams, and plots; No installation required -- try it instantly. MI-SUGAR is a tool for designing analog electronic circuits. It is built for Mac OS X 10.4 and was first distributed under the MacInit brand. The MI prefix comes from MacInit, while SUGAR is a wordplay referring to the SPICE simulation engine.The circuit simulation engines of MI-SUGAR are the free tools SPICE and Gnucap. The user can create analog circuits using the schematic entry tool or the netlist editor, then run the simulation and, finally, inspect the results in the graph plotter. Users can also build their own library of circuit elements, export schematics to SVG, convert schematics to SPICE netlists, plot simulation results in a window each, support for creating custom subcircuits, connecting elements by dragging from the endpoints, etc. There are still many circuit simulator running on Mac not been involved in this article. If you know some other good circuit simulator on Mac that I have not listed here, no mind to share with us.